You know how it goes: you visit the dental office, and your dentist tells you to floss more often. Perhaps your dentist finds a spot of mild gum disease, giving you even more reason to start flossing regularly. The truth is, you really can’t maintain long-term oral health without flossing. Brushing and using mouthwash play a big role in a healthy smile, but nothing gets between teeth and below the gum line like flossing. Part of the problem for some is that they don’t know how to floss properly. Many people think they’re supposed to pop the floss in and out between teeth and use the floss as a way to simply dislodge pieces of food that have become stuck. 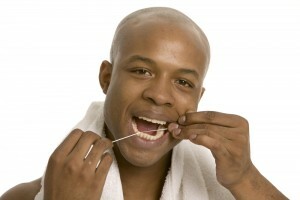 In reality, flossing helps remove the invisible bacteria that live on your teeth and around your gums. That’s why flossing every day is so vital. You might not see anything on the string of floss when you’re done, but that doesn’t mean the floss isn’t working. In fact, flossing regularly can help you avoid the buildup of that white, gooey stuff (a mixture of mucus and bacteria known as materia alba to your dentist) that you might sometimes see on your floss if it’s been a while. So, now that you know why you should floss every day (yes — every day! ), let’s talk about the best techniques to get the job done well. First, wind the floss around your middle fingers, not your index fingers. Your index fingers need to be free to act as guides for the floss. Wind the floss so there’s a one- to two-inch section between your fingers. Keeping the floss pulled taunt, use your index fingers to lead the floss between your teeth. Be gentle — don’t pop the floss in between teeth, but do it slowly. Once the floss is between teeth, lead it slowly up and down, pressing against the sides of each tooth. Pull the floss around the curve of each tooth so that all the sides are scrubbed. Lead the floss down below the gum line slowly. This part is especially important. Part of the reason flossing is so essential is that dental floss can get below the gum line in ways that brushing alone cannot. When you’re done flossing between two teeth, move on to the space between the next two teeth with a clean section of floss. Make sure you floss behind your back molars as well! Gum disease causes gum and bone loss, eventually leading to tooth loss. Floss every day to help yourself avoid complex dental care problems in the future! Turning off the tap when cleaning your teeth could save over 12 litres of water per person, according to new research. The research, conducted by Save Water Save Money and the British Dental Health Foundation for National Smile Month, has revealed that nearly two thirds (64%) of 7 to 10 year olds admitted to leaving the tap running while brushing their teeth. The research has also shown that in homes using a water-saving aid, only six per cent of 7 to 10 year olds left the tap running, saving more than 4,230 litres of water in the process. The Foundation and Save Water Save Money are encouraging people to think about saving water as well as saving their teeth during the Foundation’s annual campaign, National Smile Month. Chief executive of the Foundation, Dr Nigel Carter, said: ‘Many people believe after brushing their teeth they should rinse their mouth with water, when in fact it is better for oral health to spit the toothpaste out. This ensures that the fluoride found in most toothpastes will remain on the teeth and therefore continue to remain effective. Tim Robertson, Director of Save Water Save Money, said: ‘Linking one of National Smile Month’s key oral health messages with the “turn off the tap: campaign makes it an action everyone can relate to. Taking place from 20 May to 20 June, National Smile Month is theUK’s largest oral health campaign. Save Water Save Money is working in conjunction with theUK’s Water Companies to encourage water efficiency by raising awareness of the high levels of water wasted in the bathroom. Some participating Water Companies are offering their customers free or discounted Toothy Timers, a two minute teeth timer with a funky crocodile attachment, in support of National Smile Month. Christina Warriner analyzes DNA from the bones and teeth of ancient people to study human evolution in response to changes in infectious disease, diet and the environment over the last 10,000 years. Using samples from ancient skeletons and mummies, she investigates how and why lactase persistence, alcohol intolerance and HIv-resistance have evolved in different populations around the world. As an archaeogeneticist, she’s particularly interested in bridging the gap between archaeology, anthropology and the biomedical sciences. Listen to this brief talk by Christina Warriner….dont forget to brush and floss. Get your blood pressure checked before your dental appointment! High blood pressure, also called HBP or hypertension, can affect your ability to receive oral healthcare. Performing dental treatments on patients with hypertension can be detrimental! If your blood pressure is too high, many dentists won’t schedule procedures until you receive a health assessment from your medical doctor. The two forces measured for your blood pressure reading are the blood pumping out of your heart and into your arteries (systolic), and the heart resting between beats (diastolic). Normal blood pressure readings for a healthy individuals who are 20 years and older should be below 120 for systolic and below 80 for diastolic. If blood pressure readings are consistently higher than 120/80 then you’re probably suffering from hypertension. According to Heart.org, the website of the American Heart Association, “Untreated high blood pressure damages and scars your arteries.” High blood pressure increases risks of blood clots, organ damage, heart attacks, and strokes. High blood pressure also results increased plaque build-up and weakening blood vessels. How does high blood pressure affect my dental health? In a white paper released by the American Diagnostic Corporation, it states: “…elevations of blood pressure can increase a patient’s risk of experiencing a stroke or myocardial infarctions in the dental chair.” Patients with hypertension can also be in danger from local anesthetics that use vasoconstrictors, such as epinephrine, which increase blood pressure and heart arrhythmia. High blood pressure medications can also affect your dental wellbeing. Some prescriptions cause dry mouth and may also alter your sense of taste. Meds with calcium blockers can also create gum overgrowth, which can affect a patient’s ability to chew and may require periodontal surgery to correct. Will my dentist still treat me if I have high blood pressure? Most dentists will not treat patients who have(untreated) high blood pressure, especially if your numbers are in the Stage 1 or higher range for hypertension. If you’re being treated for high blood pressure, it’s important for you to discuss your condition and your medications with your dentist before beginning any treatments. Most patients being treated for high blood pressure can still have dental procedures, take anti-anxiety medications (often used for oral conscious sedation), and safely receive local anesthetics.